Description: Power for the Ford Hauler traverses a trestle in St. Paul. Description: CP 4509 shows off its new attire in the midst of two newer, yet more shabby CP SD40-2's. Description: Canadian Pacific GP38-2 4509 looks like it has a fresh coat of paint on it. Description: Two geeps back down a lead and head towards the industries just north of Humboldt Yard on a great summer morning. Description: Right after we passed this, a bandit was trailing it. I was fuming that I didnt get a shot of the bandit. Title: CP 4509 CP's Tomah Sub. Description: CP La Crosse Roadswitcher. Description: CP's La Crosse Roadswitcher, Switches the Yard with Snow Flakes Floating in the Air. Description: CP's Switcher Works the Yard. 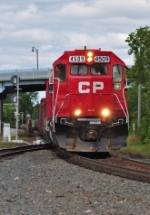 Description: CP Rail road switch pulls up to service a nearby industry. Description: Roadswitcher Power, CP-4509 SOO-4442. Description: Seen from "High Bridge". UP Western Ave Yard below. Title: Hi-rail truck / can you spot the train? Description: Well I could, but that would be getting greedy now wouldn't it? Eastbound 282 passes the local, which will give them a rollby. Description: The local job's conductor inspects 282 as it clatters past. "SOO 6025 East, you look OK and complete past Portage Junction!" "Roger that, thanks for the roll-by. 282 out." Description: The CPs delivery of cars to the UP comes up to the rips before getting a light and route into Belt Yard. Description: My 4800th shot. A pair of GP38-2's finally get the OK from Northtown to head over after waiting for a few hours. Description: The two Geeps and 50 cars approach the bridge with the BN at Northtown, which is where these two Geeps will be headed. Description: No less than four units at Ford Yard today. Thought I only would find two. Lucky break! Description: A repainted Soo 38-2 and a still pure red-and-white sibling ilde at the end of Ford Yard on a cold. crisp Pearl Harbor Remembrance day. Description: Color distortion caused by Metra's window tint. Description: Six loads, eight empties. Description: The daily CP Superior train roars north at Interstate with a GP38-2 leading the way.